Severe and unstable weather conditions can be a common occurrence depending on where you live. This has resulted in thunderstorms that cause power outages, which has had a negative impact on the residents of the region as it affects their lives and isn’t good for business. However, the ideal solution to this kind of power problems is the use of backup generators. 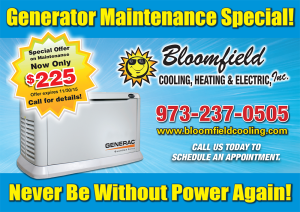 Bloomfield Cooling, Electrical and Heating, services, is the company to call on when you need to solve such issues. We handle all power related issues. 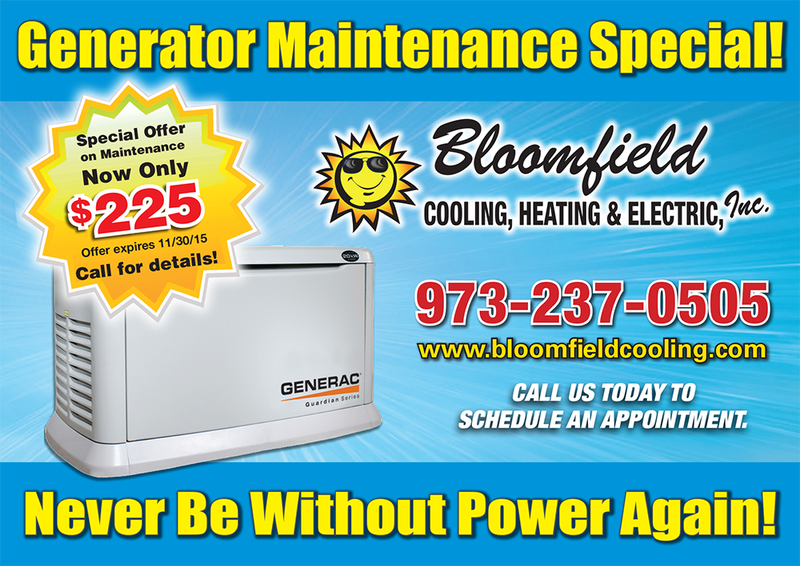 We can help you purchase, install, and maintain your backup generators. We can also make it easy for you to upgrade to a stand generator when necessary because we are great at what we do. Bloomfield has been and remains a family owned and operated firm since the year 1988. We supply generators marketed by Generac Power Systems a highly trusted generator brand in the country. There is no need for you to go through the stress of purchasing and installing backup generators yourself, when our experienced technicians can handle it for you. And it is important to note that if a novice installs a generator, he or she is bound to make errors which in turn can cause damage that may incur unnecessary expenses that could have been avoided. So it is wise to allow our experienced technicians at Bloomfield Electrical handle this for you. Bloomfield has a highly efficient team of experienced individuals in electrical services, who offer excellent customer support. They are reliable workers who will make the experience worthwhile and one that you will not forget in a hurry. Our employees and clients are important to us which is why their safety is considered as the top priority. We are insured and have best tools available in line with the safety regulations and industry rules. Since our launch, we’ve had a high rating when it comes to customer service. Many home and business owners have expressed their satisfaction with us. 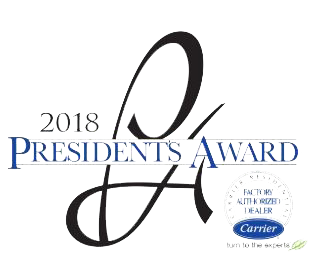 They continue recommending our services to others which has won us accolades like the Angie’s list Super service awards and the Best of Essex readers contest under the best HVAC and electrical agency category. Our clients are always happy with our services which is a reason why we get many referrals. We know what to look out for when buying a generator, and we’ll definitely choose the right option for you. Just contact us to book an appointment and we will be there at your service. We will recommend a wide range of generators that meets your requirements and help you make decisions when it comes to installation and maintenance. New Providence, Berkeley Heights, Summit.